Rabbit is vastly under-rated. It’s cheap, tasty, plentiful and versatile, but not very widely eaten. This should change. Rabbit is a superb meat, and it deserves a wider audience because it fits well with the needs of the modern cook – it’s lean and healthy, it cooks quickly and doesn’t take a lot of preparation, and its reasonably easy to get ethically sourced rabbits. There’s more on why rabbit-eating is a good idea here. 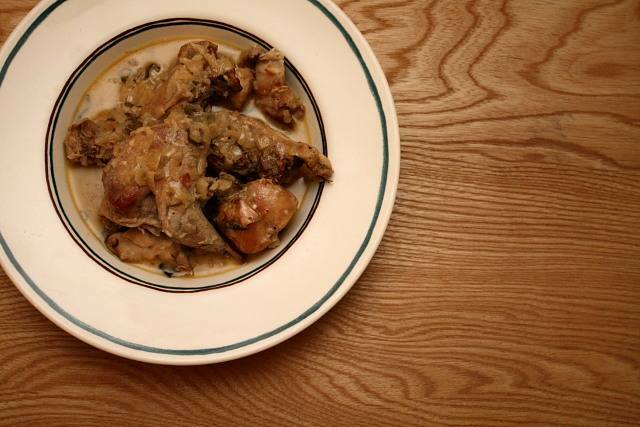 This is a very simple French dish of rabbit braised slowly and flavoured with mustard. It takes a while to cook, but none really to put together. It’s fast slow food, if you get my drift. Start with a whole rabbit, which should cost about £3 or £4. A wild one is best, something shot by a farmer as a pest … the meat is tastier, and the farmer is happy. Win-win. Joint the rabbit into serving pieces about an inch square. This involves a fair bit of surgery with a heavy kitchen knife or a cleaver. Just aim for nice meaty chunks. Put the rabbit in a large bowl and add two tablespoons of Dijon mustard, stirring and massaging it into the meat. Fry the rabbit pieces in butter in a single layer in a big pan. Leave the meat to brown for a few minutes, then flip it over and finish the other side. This should take seven or eight minutes in total. Be sure not to stir the meat around – just let it sit in the butter browning away and caramelising underneath. Whilst the meat is browning, gently cook a large onion, diced, a crushed clove of garlic and a big handful of chopped chestnut mushrooms in another pan until they start to soften, but before they start to brown. Add the onion and mushrooms to the rabbit, and splash over a big tablespoon of white wine vinegar, letting it bubble and reduce before adding a large glass of white wine. Let the wine boil briefly to rid it of alcohol, then top up with water until the rabbit isn’t quite covered. A bay leaf, a few sprigs of thyme and some chopped sage leaves should go in at this point, too, as well as a good seasoning of salt and pepper. Put a lid on the pan and place it in an oven preheated to about 180c for an hour. Take the lid off the pan for the last fifteen or so minutes. The rabbit should be tender and pull away easily from the bones. If it isn’t, put it back in the oven for another ten minutes. Add a couple of generous tablespoons of creme fraiche to the pan and stir through. If the sauce is too thin, reduce briefly on the hob. Finish the dish with some chopped parsley and serve with green beans and bread. I do love this recipe – I made it a few times last year and through it managed to convert a good few mates to the wonders of rabbit! this looks lovely, just my kind of thing. I like Rabbit, yet have only cooked it once – in a Stifado. I’ll give this a try. Where did you get yours from, Rich? That one came from the market in Bradford, but I normally get them from Binns in Saltaire. Those ones are shot on a farm up in Malham, I’m told.